I know I am a little behind on the Mamak train, I have never tried Mamak until last night. When I lived in the city, I would walk past Mamak every night and there would be a huge line. I always wanted to try it, but never really had the patience to line up. After all of these years, I finally decided to try the restaurant in Chatswood with my partner. The long wait was worth waiting and I don’t know why I didn’t try this sooner! I am a huge fan of Roti and having browsed the menu prior to going to the restaurant I was keen to try Mamaks Roti! We decided to order the Murtabak ($12) with lamb and inside had spicy lamb, cabbage, onion and eggs. The menu does specify that this will be a 15 minute wait. Once it came out it looked amazing! All the ingredients were rolled up into the Roti and then cooked over a hot plate. The Roti also came with 2 dipping sauces and chilli sauce, absolutely delicious. We then also ordered the Chicken Satay skewers ($9 for 6 pieces). These were scrumptious, very generous with the sauce in a bowl. The textures were very divine and I thoroughly enjoyed these. Our final dish we chose was Mamak’s Classic Chicken - Kari Ayam ($16). My friend told me prior to going that this would be a bit spicy for me. The chicken pieces were very tender; I think the chicken used were thigh pieces. At first I started eating and didn’t realise there was bones in the chicken, so be careful when eating this. The chicken was very tasty with boiled rice and not too spicy for me and I don’t usually eat spicy food. My partner also ordered Mamak’s Kopi Tarik ($4), Malaysian white coffee. This was very interesting as it was in a mini pint glass. The coffee was all foamed up and looked amazing. The taste was even more surprising, it was very sweet. When we paid the bill the waiter told us that the coffee is mixed with condensed milk and that is why it taste soooo good, but sooo bad if you have too many. Later when we walked outside of the restaurant I got to watch the chefs make the Roti from the outside window. I hope I didn’t creep him out a bit because I stood there for about 5 minutes lol. 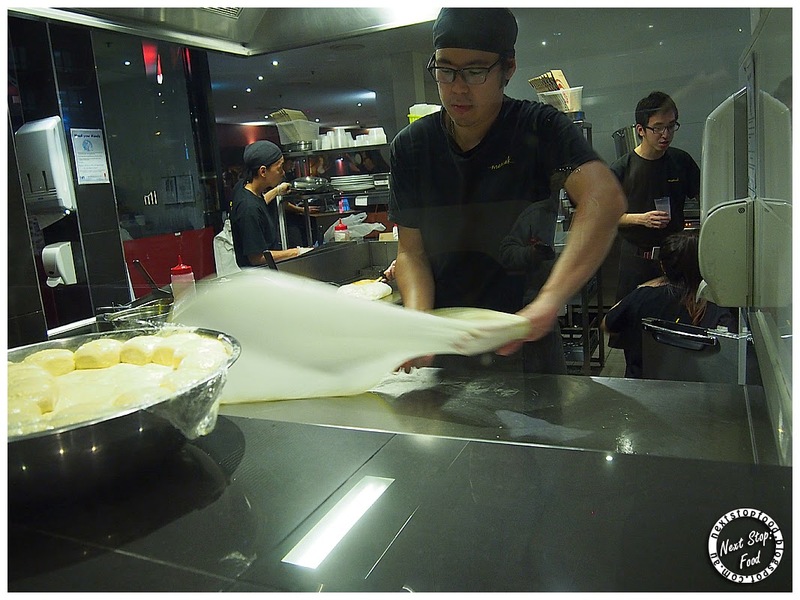 It was very interesting to see how they create the Roti, they have a little ball and they roll it out like a pizza into a flat sheet and then add the ingredients and fold it up. Exciting evening in Chatswood, trying Mamak for the first time and it was a great experience. Our bill came back $50 even and I was expecting it to cost more. Cheap food, delicious food and tasty coffee. Is that the cone looking thing??? I saw it when we were leaving and I really wanted to try it! Will definitely try your suggestion next time suze! yes will definetly try this next time I go!! Thanks for the suggestion!!! Agreed with Suze and Helen! And I love Mamak too! Will have to definitely try the dessert Roti Next time!!! We'll alpha off by authoritative a few absolute important observations so you get a feel for what it takes to be acknowledged (actually accomplish money) in this business. First is Acquaintance - not artlessly the affectionate of acquaintance of "owning something"; but absolute alive acquaintance in a restaurant. Montreal is additionally the city which you could enjoy some low-cost enjoyment. You are able to try to eat out reasonably in some of the determined Montreal dining places. Without having d�cor in high quality along with taste, you can get pleasure from a number of foods civilizations through across the world proper with Montreal. These all delivers you a large selection regarding fulfilling along with appetizing dishes.